As promised Lord George Murray and I had a crack at Lobositz this afternoon. What a lot of dashing generals coupled with rolled sixes. Anyway, we went at a leisurely pace, and as the gaming session drew to a close the fog lifted at the end of move three and 5.5 of my Prussian units had already legged it off the board - the rule about nearby troops being affected by routers really clobbered my crowded army. Will return with a few photos and a full battle report after completion next week. One week later... Where are the photos ?! 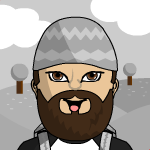 The completion of the battle will start in about one hour, then I have to locate/or buy anew my camera USB connector - then photos and AAR can be delivered. 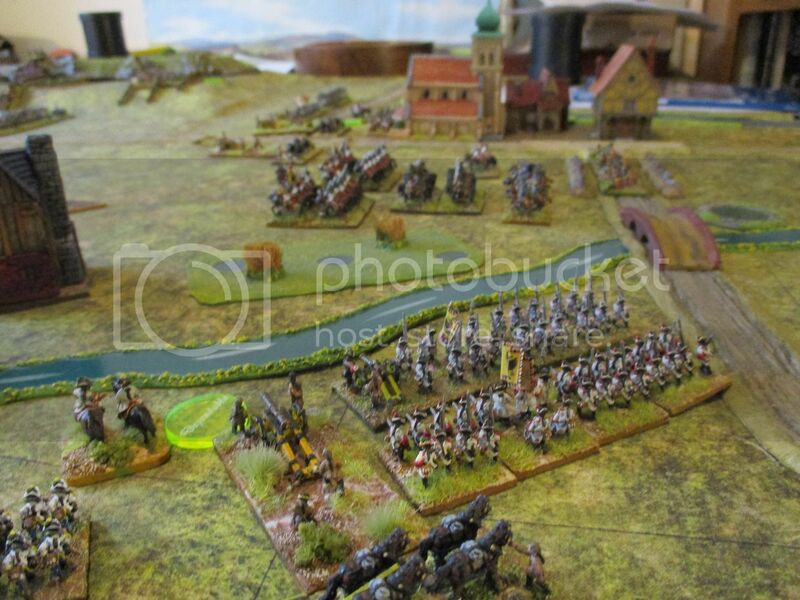 The battle opened with a surprise Austrian cavalry attack as a result of dashing commanders rolling sixes. 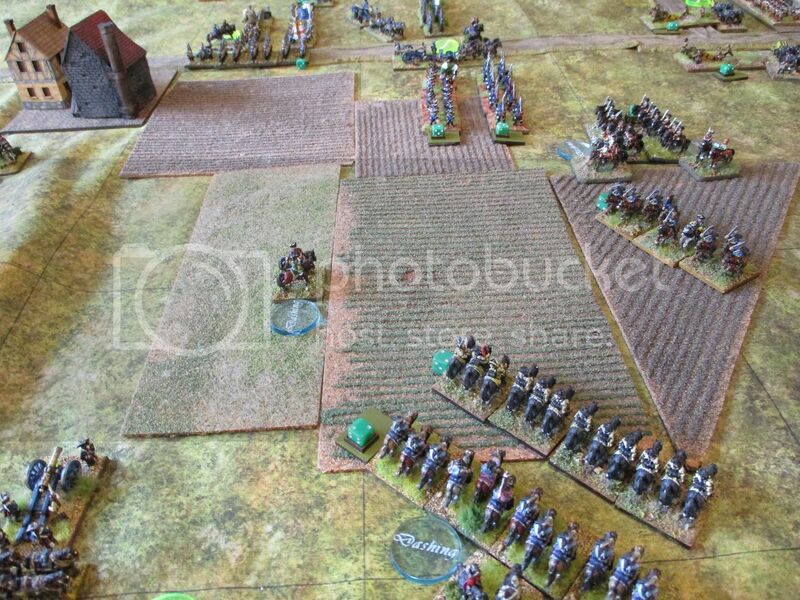 The Austrian cuirassiers swept through the Prussian cavalry centre like a hot knife through butter. The Prussians attempted to stem this by attacking with their right wing cavalry. but were badly shot up by the Austrian grenadiers garrisoning Sullowitz and then deftly countercharged and seen off by Austrian dragoons supported by hussars. Meanwhile the Prussian left was suffering growing losses from the grenzers in the vineyards, to the extent that one battalion retreated whilst another was done for. And in the centre the Prussians were also suffering from the effects of superior artillery fire, with troops falling back left and right as they took additional morale losses from those retreating or routing around them. 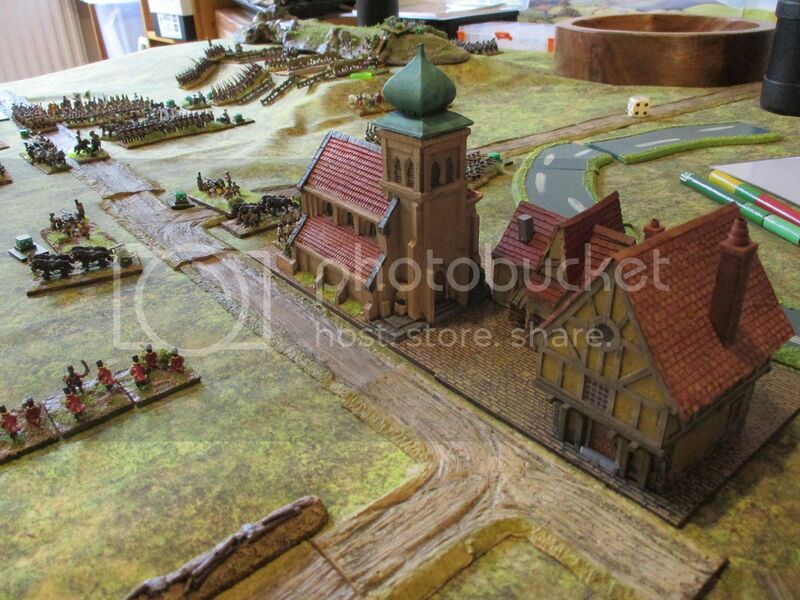 this was a tough game for the Prussians who just could not seem to get to grips with the Austrians before troops retreated or routed, thus causing further mayhem to those around them. 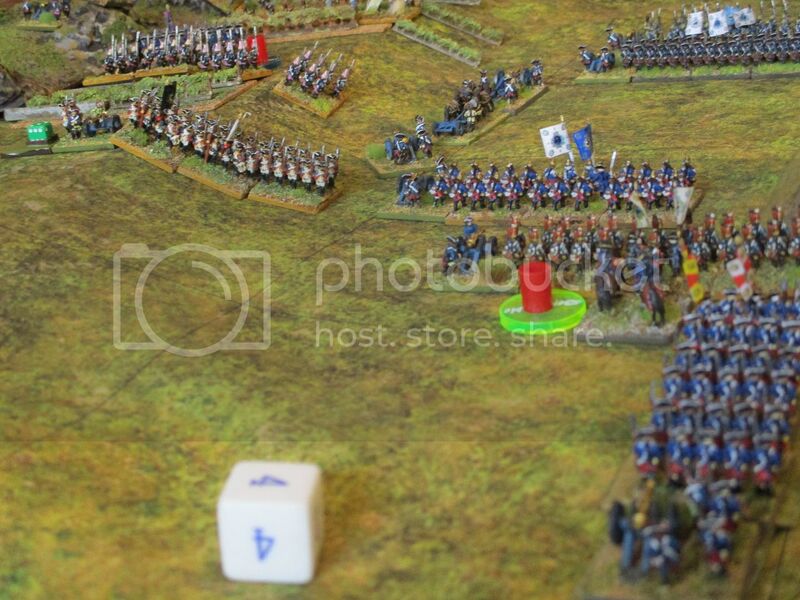 By the end of turn 6 Frederick had left the field and the Prussians had lost 11 1/2 units to the Austrian 1 and thus suffered a crushing defeat. Some more photos. The Prussian left flank. 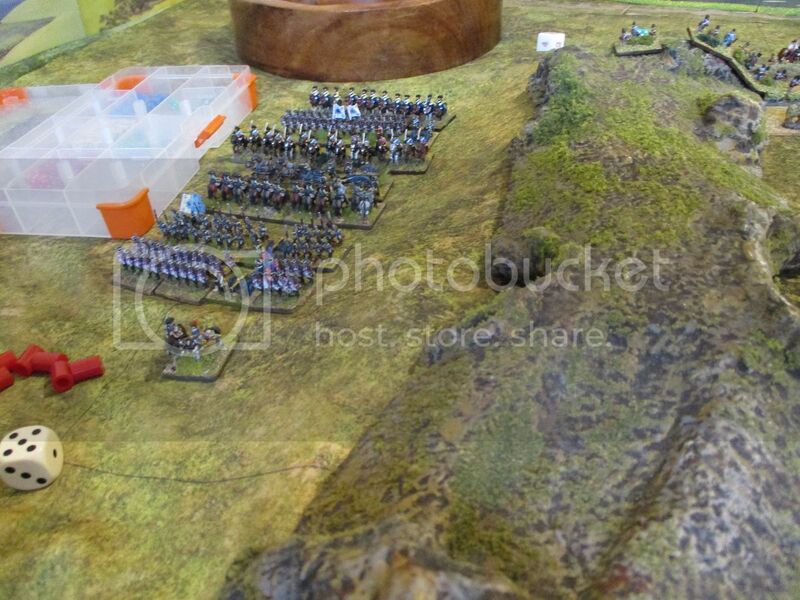 Austrian cavalry have swept through the centre leaving a huge gap. Lobositz, with the struggle for the vineyards in the background. 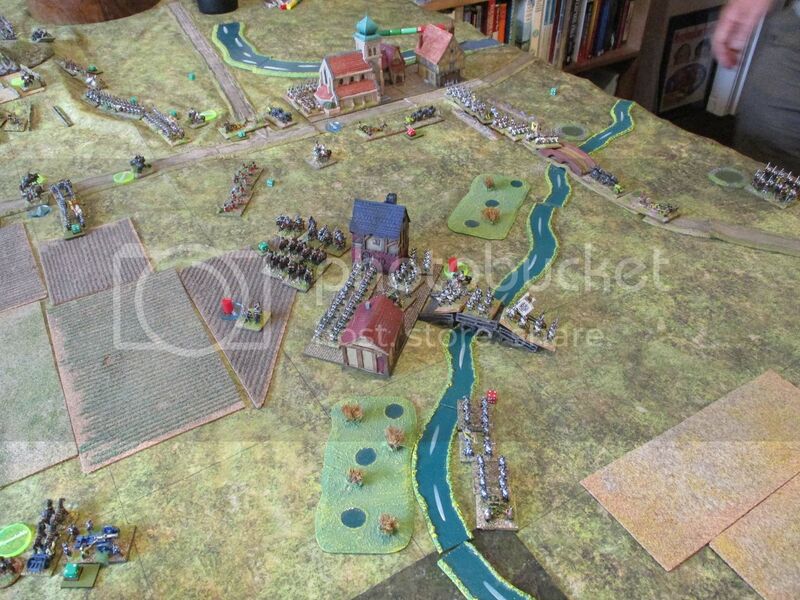 Move 6 - the Austrian army is on the march whilst the Prussians have collapsed. Great to see a stunning victory for the empress. Nice pictures too. It's fine to learn that you can describe perfectly the whole battle in some words and the pictures illustrate exactly what's going on. Thanks for that Damnitz. Glad it was worth the wait. 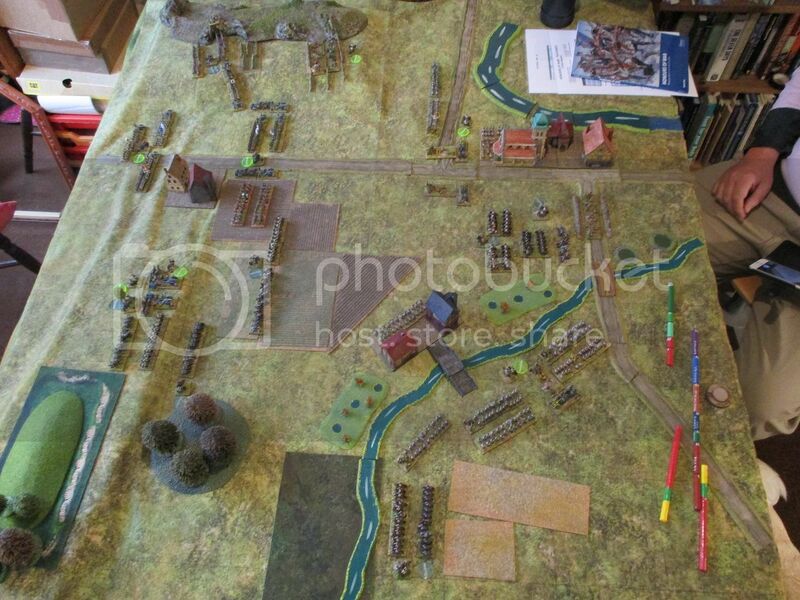 Good report, Andy, and as usual, a smashing war-games layout. The larger scales are great when well painted but, for me, there's nothing like 10mm packed shoulder to shoulder for illustrating this conflict on the tabletop! Cheers Westie, it really was great fun.